Cluster dynamics of financial centres in the United Kingdom: Do connected firms grow faster? The aftermath of the global financial crisis (GFC) has seen a sharp reduction in employment in financial services in the United Kingdom, shrinking bank balance sheets and reduction in global corporate finance and investment banking revenue. Underneath the veil of this grim picture, however, there was a lot of variation in the effects of the GFC on individual financial centres and even more so on individual firms. Peripheral regions were affected the most, while the financial services firms located in the largest financial centres were somewhat shielded. A highly unequal urban hierarchy of financial centres exists in the UK with substantial functional differences between different tiers of financial centres. While London hosts most of the big commercial and investment banks and offers a wide range of complementary products for its corporate clientele, the remainder of financial centres in the UK, with Edinburgh in the lead, offer only a fraction of the capabilities of London. Consequently, different financial centres and firms performed very differently in the post-GFC period. The implications of these processes are far reaching and extend beyond the financial sector due to the interconnectedness between financial services and the real economy. Financial centres have been termed as perhaps the most visible icons of the modern-day capitalism. Structurally they are composed of a variety of financial and business services firms that both collaborate and compete among themselves to succeed in this very Darwinian environment. In our paper, we focus on studying flows of knowledge relating to business opportunities, client risk profiles and future collaboration prospects facilitated by network connections of financial services firms to their peers in other financial centres. We aim to answer the following questions – (1) Do financial services firms with network connections to related firms in other financial centres grow faster? (2) Do financial services firms located within the proximity of well-connected firms benefit from knowledge spillovers? Source: Authors’ calculation based on FAME and ONS-BRES data. 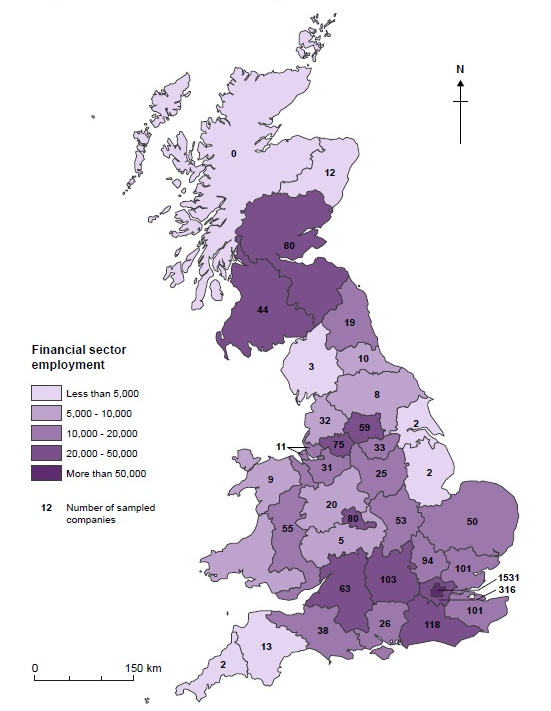 Notes: The figure shown above shows the geographical distribution of a sample of 3,224 financial services firms by NUTS 2 regions. Financial sector employment has been sourced from the Office for National Statistics – BRES database. We obtained our firm level data from the Financial Analysis Made Easy (FAME) database. To identify network connections among financial services firms, we used data on syndicated capital market deals supplied by Dealogic. Our results suggest that financial services firms with strong network connections beyond their own financial centre enjoy higher growth in the foreseeable future. We link this effect to their access to knowledge, which is not locally available and therefore allows them to exploit growth opportunities beyond what would have been otherwise possible. Knowledge flows among clusters have been found to diffuse to other participants of the cluster beyond the connected firm and therefore benefit the wider community of firms. While our results do not contradict the notion of diffusion of knowledge within clusters, they indicate that knowledge flows among clusters facilitated by firm level network connections cause the growth rates of the connected and unconnected firms to diverge. We interpret this to be the result of the increasing competitive pressure caused by the growing gap in knowledge bases of firms integrated in global networks and those that are locally embedded. This therefore means that such global connectivity of a limited number of firms in a financial centre is not necessarily an all-around bliss for all the firms in their proximity, but instead is a source of added competitive pressure and hampered growth prospects for locally embedded firms, which struggle to compete with globally connected firms. The importance of these findings is two-fold. First, forming network connections with peers outside of one own’s cluster appears to facilitate valuable knowledge flows and leads to higher competitiveness of financial services firms. Consequently, the implication of this for strategic management is that financial services firms should strive to develop and maintain a variety of network connections with firms in the leading financial centres to gain access to valuable pools of knowledge. These network connections then serve as the basis of their competitive advantage against other proximate firms. In contrast to the positive effect of externalities originating from concentration of similar firms in space, the evidence provided in our paper indicates that a locational strategy based on seeking the largest cluster may be particularly sub-optimal for small and poorly connected firms. These are likely to be at the biggest disadvantage when competing side by side with globally connected competitors with far superior knowledge bases. For such firms, it would be preferable to locate within financial centres of lower tier, which would provide more levelled playing field and allowed them to develop within an environment of lesser local competition. Read more in the Financial Geography Working Paper #4.